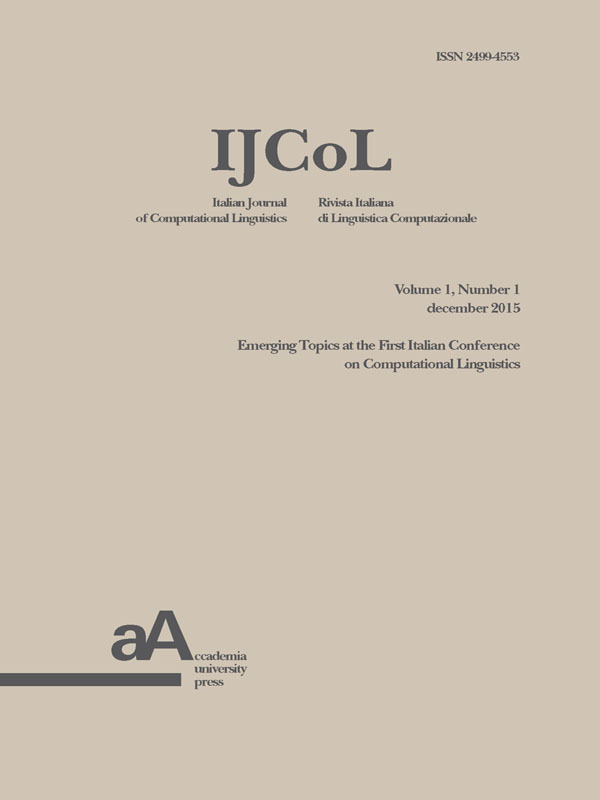 The Italian Journal of Computational Linguistics was created and is currently published by AILC. Along with the annual conference CLiC-it and the evaluation campaign EVALITA, it is one of the main tools in the service of the Italian community for the promotion and dissemination of research in computational linguistics, a field which AILC addresses from different complementary perspectives. The Italian Journal of Computational Linguistics fills a dual vacuum, at the national and international level. In the editorial landscape of the Italian scientific community, following the experience of Linguistica Computazionale, founded in 1981 by Antonio Zampolli and published until 2006, there is no longer an authoritative forum to represent the different elements of computational linguistics in Italy. As witnessed by the founding of AILC, which brings together the entire Italian community active in the field, the national landscape has now changed dramatically. In fact, we have numerous research groups involved in computational linguistics spanning across the whole territory, which operate both in the humanities and in computer science. This makes it even more necessary to have a journal that expresses the plurality of voices within this newly founded association. In addition to this, IJCoL fills a void which has been evident for too long with respect to similar initiatives in other European countries. We refer, for example, to the role played by journals like Traitement Automatique des Langues (TAL) in the French community, Procesamiento del Lenguaje Natural (PLN) in the Spanish community, and the Journal for Language Technology and Computational Linguistics (JLCL) in the German community. On the international level, IJCoL will contribute to strengthening the presence of journals in the field of computational linguistics. The potential of this effort is demonstrated in particular by the remarkable international reputation and visibility earned by Italian research over time in this field. We wish IJCoL to be a tool for publishing high quality results, obtained with methodological strictness, partly because contributions often struggle to find adequate space in other forums, either because editorial opportunities are limited or because significant results regarding the Italian language not always attract appropriate international interest. It should offer an open space for discussion, including for young researchers, where sharing experiences and results will nourish constant debate, with the awareness of the complexity of present scientific and technological challenges in the field of computational linguistics. IJCoL offers an up-to-date forum of discussion around computational linguistics, inspired from different perspectives, with the aim of nurturing synergies between different areas, i.e. those which share with computational linguistics their methods and paradigms of analysis (such as computer science and artificial intelligence), those which share language as their object of study (such as Italian linguistics, linguistics, sociolinguistics, dialectology, and philology), and those which are amplified by the role of linguistic resources and technologies for accessing and managing documentary heritage. Special attention will be given to cognitive neuroscience, where computational modeling has always had a central role, and to the contribution of computational linguistics within the larger field of digital humanities, which has a long national tradition and is currently in full development. Automatic language processing applications, such as information extraction, question answering, automatic summarization, and machine translation.